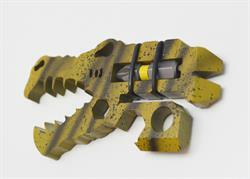 THOUSAND OAKS, CA--(Marketwired - November 12, 2015) - Vice & Anvil Tactical announces the new Jurassic Croc. 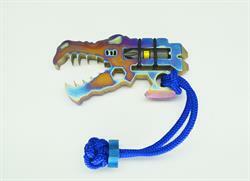 Our customers asked for a "customizable" finish, larger, and more fully-featured high grade alloy version of our popular key chain Micro Croc. We heard you loud and clear! V & A Tactical creates customer inspired "Micro" Tactical Gear for A Tactical World TM -- From survivalists to bicyclists, our products appeal to a wide demographic, specifically those seeking only the best in "micro tools" for both everyday use and emergencies. The Jurassic Croc includes a bottle opener, box cutter, ¼" hex, 3/8" hex, #2 genuine DeWalt™ Phillips screwdriver bit, pry bar/chisel and lanyard/key ring hole. It is currently available in high grade Titanium and Stainless Steel, in a variety of finishes. "Vincent Lavin Bitetti, Founder and chief executive officer, describes the company's newest offering as design refined by customer feedback," he continued. "Social Media enables us to respond to user input quickly -- enabling us to incorporate most asked for features in a timely manner -- after all, it's only a matter of time before the Zombie Apocalypse is upon us -- LOL." 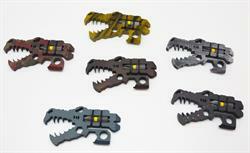 Current products include the best selling Micro Croc™, Alien Cranium™, Alien Cranium Relic™, Vice Crux 1.0™, Vice Crux 2.0™, Man-O-War™, Dragon Clip™, V&T Micro Beads™, and our new larger, enhanced Jurassic Croc. Current alloys include Titanium, Stainless Steel, Aluminum, Brass and Copper. Finishes include Powder Coat, Cerakote, TiN (titanium nitride -- almost looks like real Gold), electro anodizing, custom patinas and other proprietary finishes. MSRP Prices range from $49.95 to $129.95 depending on alloy, finish and texture treatment. All products come with a lanyard with custom beads optional. Visit our website at www.viceanviltactical.com and Follow Us on Instagram @VA_Tactical to choose your metal alloy and a pallet of design elements to personally customize your EDC tool. Give us a Like at www.facebook.com/viceanviltactical and check our customer comments, videos and photos updated regularly. About Vice & Anvil Tactical: The company was formed in early 2014 and specializes in every day carry tactical gear for the EDC enthusiast. 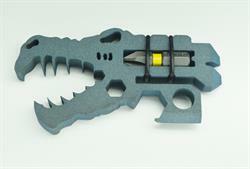 Current products include Micro and Pocket Tools -- some with personal self-defense capabilities. The company designs and finishes products in their micro tool machine shop with some special finishes provided by trusted local finish specialists. Once the tools arrive at our shop, they are tested for durability and reliability. After that, they are cleaned, polished and prepped for our metal-centric artisans. Our artists sand, grind, etch and buff to spec before applying proprietary finishes. In addition to scratch resistant finishes, proprietary Glow in the Dark compounds and other aesthetic nuances are employed on a case by case, customer requested, or limited product run. Our high quality metal is sourced and cut to our exact specifications by Crane Technology in Westlake Village, CA -- using a unique ultra-precision Water Jetting cutting technique. Their customers have included NASA, The Boeing Company, Rocketdyne, Lockheed Martin and other military and civilian contractors (contact: Winston Sanders at (805) 379-4948). Vice & Anvil Tactical ships worldwide to discerning customers seeking products that really work and are "Made in the USA." All companies and/or products mentioned are either trademarks or registered trademarks of their respective owners. Highest Grade 2 Titanium. 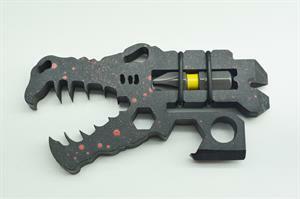 Hand Crafted, super Anodized Jurassic Croc in Cyborg Rust.